Home › News › SPRING CLEANING - FUNDRAISING FRENZY! SPRING CLEANING - FUNDRAISING FRENZY! Clean Out Your Closet and Help Waterloo Region Football at The Same Time!! By donating gently used clothing, shoes, accessories, books, linens, small household items (no furniture), and E-Waste you can help raise money for Waterloo Region Minor Football. Help us reach our $5K goal! We get paid for every pound of goods donated! NO Loose Donations! 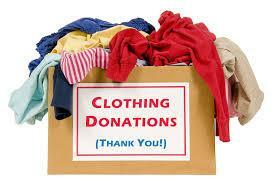 Please collect all soft goods (clothing, towels, linens etc) in large garbage bags tied at the top. Do you have an old TV or Radio lying around collecting dust? How about a printer that does not want to print anymore? Used, unwanted or out-of-date phones, ipods, tablets, laptops can all be recycled, keeping them out of landfills and directly benefiting PRegion Football!! 1. Every player who brings in at least 5 green garbage bags (75L) of donated soft goods (clothing, shoes, linens, towels) will be entered into a draw to win a $100 Best Buy gift certificate! Collection Details & Huge Thank You to Access Storage! We will start collecting your soft goods donations at each practice from now until May 16! We will be storing them in a storage unit that has been generously donated by Access Storage on 50 Ottawa St South, Kitchener. Thank you for your support! For large E-Waste items, we ask you to drop them off to Access Storage on specific dates that will be announced shortly or we can arrange pick up if needed. Help us reach our first goal of 2018 to raise $5000 for Waterloo Region Minor Football. Funds raised will go directly towards purchasing equipment, field rentals, bus travel, referee fees and general facility expenses. While player fees go towards these costs, they do not cover all the required expenses, so we need to subsidize our revenue by fundraising. Help us continue to provide an affordable football program for youth in Waterloo Region! For any questions or to arrange a pick up please email Melissa Ladouceur.